There’s something about the clash of urban decay with elegant beauty. I’m still trying to figure out what it is that I find so interesting about it. Maybe I am sub-consciously trying to mock the traditional sense of beauty and style. There is the classic image of the beautiful, victorian princess descending an elegant staircase to make her grand entrance to the party. ….And here we have our beauty descending quite another kind of staircase, but certainly in a similar manner. Is she any less beautiful? Or does she seem more beautiful because of the ugliness around her? OK…Another Helmut Newton tribute…at a garage instead of on the beach. I found this huge iron wheel and it brought to mind DaVinci’s Vitruvian man sketch. The idea championed by the architect, Vitruvius, that the human body is the basis for all architectural and physical perfection is interesting and food for much debate. Working with an extremely physical and athletic model is very liberating. Tracy is one of the best at posing her body. The hours and hours of training and practice for body building and figure competition also translate into beautiful posing in front of the camera. 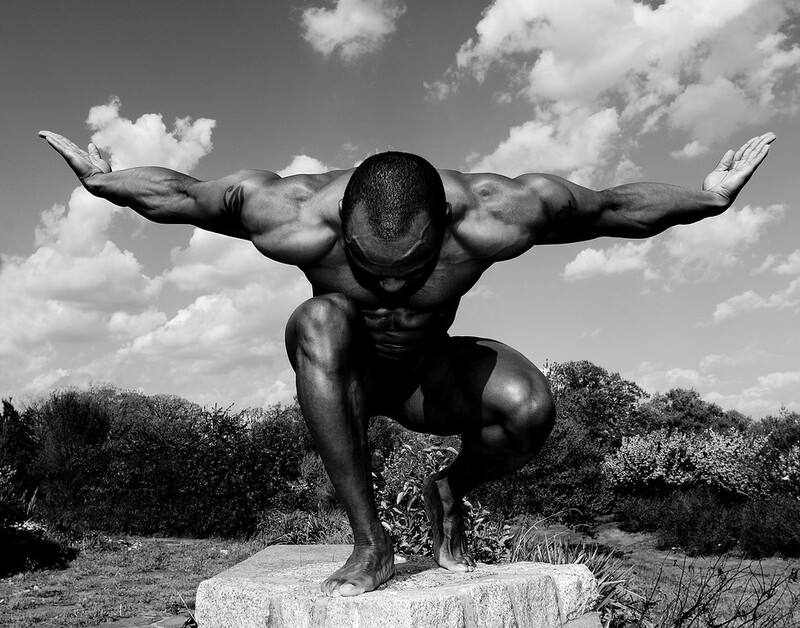 An athletic model can also create and hold physically challenging poses and make them look easy and natural. With this image, I didn’t want to just photograph a model in a black dress. I wanted the subject to challenge the viewer…Pulling up her dress. An act that would, in most cases, be interpreted as submissive instead becomes assertive or aggressive. Through the powerful physical presence of the model, the direct and serious expression with eye contact, and the low camera angle, she is not giving in to anything. She is lifting her dress. But its all on her terms. The victorian idea that exposure is weakness is destroyed by the attitude of the subject. This shot was made in the early afternoon with one hand held stobe as fill and minor Photoshop revision. A very classic pose. Form and symetry take over. This is the pose I wanted and the best shot from the day. I found this small crane platform truck at the University of Scranton. It was the perfect setting to make a shot like this. There is a lot of power to be found and taken by mixing the environment with a model and his or her personality. Each environment has a personality of its own and when it is mixed with that of the model it can create something very unique. All too often, I believe, photographers think of portrait or fashion shoots as, “I am going to photograph her in this place or that place”, and make the environment secondary or, worse, an afterthought. The environment is as crucial to the image as the model! I used one handheld strobe for fill on this one. Minor Photoshop retouching…with a high contrast luminosity curves adjustment. Am I the only one in North America That wishes French Photo Magazine was printed in English??? The photography is amazing, but I can’t understand a word of the articles!